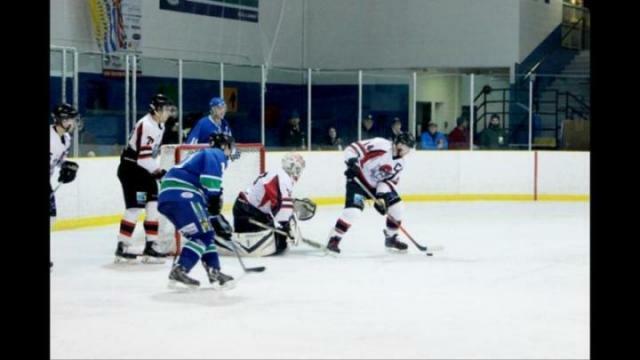 The Rupert Rampage stumbled into the Christmas break with a 5-3 loss on Saturday night to the Smithers Steelheads. The Rupert Rampage stumbled into the Christmas break with a 5-3 loss on Saturday night to the Smithers Steelheads at the Jim Ciccone Civic Centre. The loss is the fourth in the last five games for the team, which likely welcomes the four-week break with open arms. Trailing 4-1 late in the third period, the Rampage (5-5-1) mounted a comeback that would ultimately run out of time on bring-a-food-donation night in Prince Rupert, which went to support the Salvation Army. Rallying late in the game made it a tough loss to swallow, said forward Josh Cook after the game. “I know we got outplayed a little bit but we gave it our best shot out there and sometimes, breakdowns defensively end up in the back of the net,” said Cook, who scored Rupert’s opening goal, which tied the game up at 1-1 in the first period. The Rampage pulled goalie Brett Roth, with just over two minutes left in the game, which is a gamble that has worked for the team before. “We battle to the end, regardless of what the score is and that’s something you’ve got to credit the guys with, is that they never quit,” Cook said. Instead of being at each other’s throats when they were down, the Rampage’s leading scorer (four goals, 10 assists) said the guys were supporting each other and “that’s the key to coming back in any game.” There were other positives to take from the loss, too. “I think our offensiveness was pretty good. I know we didn’t score that much, but we created a lot of chances,” Cook said. The Rampage definitely didn’t look like it was being overpowered by a much-better team. Both teams had plenty of scoring opportunities, but Smithers converted more of its chances. The Steelheads (7-3) opened the scoring just over three minutes into the game on a breakaway goal by Raj Sangha. Thanks to increased pressure by the Rampage in the second half of the period, Cook converted on a nice pass from Jordan Aubee to tie the game at 1-1. In the second period, Sangha gave Smithers back the lead on a shorthanded goal. The Steelheads padded to the lead late in the period on another marker by Joel Gellvear. Most of the action took place in the third. The teams traded scoring opportunities, but the score remained at 3-1. Roth looked sharp, coming up with some big saves when he was challenged. The penalty killing unit was also good for the Rampage. Tyler Halliday took four penalties — and the whole team had six — but didn’t give up a goal. Gellvear scored with 4:41 left to make it 4-1 and that’s when the Rampage woke up. For the last few minutes of the game, the team seemed full of energy and momentum. It started with a goal by Jared Carter with 2:45 to go. Shortly after that, the rhinos pulled Roth to make it a 6-on-5 situation. But Brendan DeVries put his seventh goal of the year into the empty net to make it 5-2 and deflate the Rampage hopes. Despite that, Jacob Santurbano deflected a shot from the point off the stick of Marcus Atchison to cut the lead to 5-3, but the Rampage simply ran out of time. When the team takes the ice again in January, they play three homes games, which are important going into the playoffs. Rupert’s team still has improvements to make. “Our goal is to get all nine points out of those three games and I know that we have to focus on our d-zone play and man-on-man. As you can see tonight, it was lacking a little bit and we were all over the place,” said Cook.